Maddy was drawn up from the start as a stock plan by Sven Oftedal of our office. He worked from a sketch done by Tom many years ago, when we were doing restoration work on a similar larger classic powerboat at Hilton Head Island, South Carolina. The concept seemed a good one and I kept this little sketch for nearly 20 years until a time came when it made sense to develop her into the little yacht I always intended her to be. Sometime in the late 1990s I traced the original sketch in ink and put it in the idea designs section of our web site. When she attracted frequent interest and yearning communications from people all over the world, it was obvious we should develop her somehow. 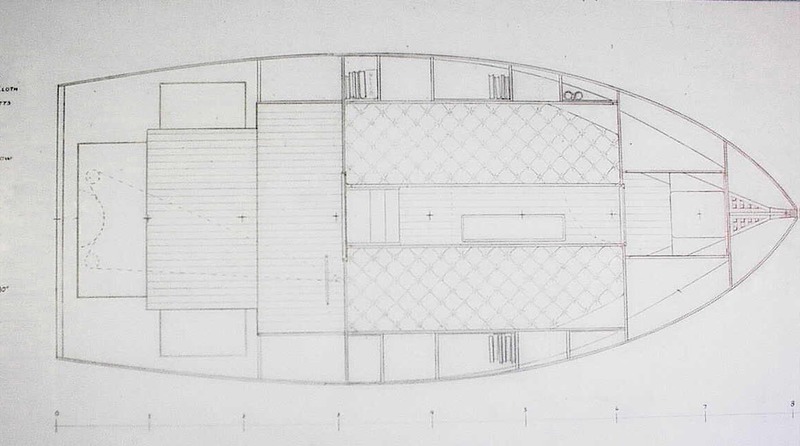 When Sven needed a project that would advance his professional qualifications in some areas related to his studies with our Yacht Design School, we had him sit down and translate her into a working set of plans. I fear that the vision I had of her was so complete in my head that I must have driven him nearly crazy getting him to get my vision on the drafting film. Fortunately Sven is very good so it did work well for both of us, for Maddy, and ultimately for the client who builds her. The idea behind this design is that unfortunately small powerboats always seem to be day boats. If they have any accommodations at all they are an obvious after thought. Since they also almost always have a tremendous amount of horsepower and a planing hull, you end up with a boat which is extremely expensive to operate and can only be used to tear back and forth within close proximity to your home port's fuel dock. Thus unless your only goal in life to race back and forth displaying bikini or Speedo stuffers, depending on your preference, you will soon tire of the boat and the expense and put it up for sale. This is why small high speed stock powerboats are commonly available used for a price which indicates that you are paying for the engine and getting the boat for nothing. In reality most of them are so poorly built that you are getting the engine and an obligation to try to patch up the hull that goes with it or find a land fill that will take it. With Maddy you avoid all that. She is much better for going out for the afternoon in that she is extremely economical to build and operate, much quieter, has character, and you have facilities to cook, take a nap, attend to nature calls in privacy, and get out of the sun. You can still use her for a display rack for people in bathing suits if you want but she is a lot more versatile than that. In addition to this afternoon use, Maddy can provide you with a whole way of life. When you get aboard Maddy it may be for a weekend cruise, a two-week vacation, or an extremely economical winter's cruise south to warmer climates, just as you choose. Further she is a vessel that people on shore and on other vessels will not mind seeing coming. At ordinary cruising speeds she need not leave any significant wake. She is quiet and she is cute as a button. This means that wherever you go people will be interested to see you, happy to meet you, and eager to help you out whenever they can. Try that in your average cheap, noisy, high speed, wake throwing, styled by "industrial designers", afternoon toy. All the way forward in the eyes of the ship there are two chain lockers. One should contain 35 fathoms of 1/4" galvanized chain and the other 35 fathoms composed of 1/2" three strand nylon and 3 fathoms of 1/4" chain. Each will be attached to a 25 pound CQR anchor. Just aft of the chain lockers there will be an enclosed head, which may have a fitted bucket, a Porta-Potti, a head and separate holding tank or a Raritan treatment system. Just remember that you will have to choose a system that will allow you to pump overboard. So far they have managed to make laws that say you cannot pump overboard but have not been able to induce people to be enthusiastic about handling other people's sewage. The result is that it is almost impossible to find a place to legally pump out in most areas. You'll probably have to resign yourself to some variant on breaking the law unless you get the Raritan treatment system. Of course municipalities pump huge amounts of raw sewage into the very areas where people are most determined to believe that yachts are polluting, but that's different because they are doing it themselves. The main saloon has two settee berths with lockers under and outboard. The outboard lockers have bookshelves above them. There should be plenty of room on these shelves for a good collection of cruising guides, historical references on the areas you are cruising in, your favorite boat books, and that copy of Adam Smith's "Wealth of Nations" that you are always trying to get the time to study further. From the main saloon, you step up into the wheelhouse. This has the steering station to starboard, along with any instruments you care to have and a folding helmsman's seat. 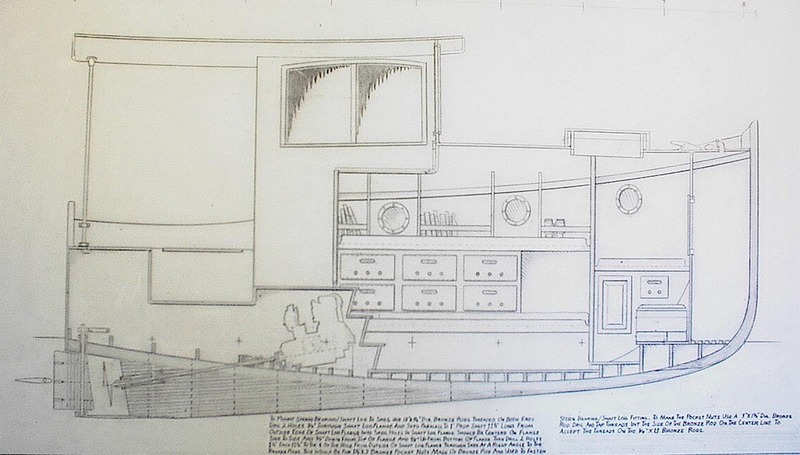 To port there is room for a small galley. I would normally use one of the little pressure camp stoves that will burn about anything and are sold by L.L. Bean. Instead of a sink, I'd use a large plastic washbasin, which can simply be dumped over the side. The galley is, by necessity, simple. This means that your food items, tableware, cookware, and any ice chest will probably have to be arranged in storage built to suit in the cockpit lockers. Normally I would suggest that the back of the wheelhouse have roll up zippered canvas curtains, probably in a tan or off white canvas. You should also have similar curtains that can close off the entire aft deck. This gives you a choice. You may wish to curtain off at least half of the wheelhouse if cooking underway and you will very commonly want to curtain off the entire aft deck in the evening to give another sleeping cabin for children, with a filler piece in the middle, or just a lounging area protected from a cool breeze, inclement weather, or mosquitoes. I would recommend using a traditional looking "soft" canvas for the curtains. Best appearance will probably be achieved with a rich tan cloth. I would avoid harsh colors or bright white. This boat needs a classic understated appearance. As you can see, every inch of this little vessel provides for versatile accommodations. She can be quite a little vacation home for those with a modest budget and the intelligence to realize that people will respect them more for having a vessel like this than even the biggest chrome plated fire breather. 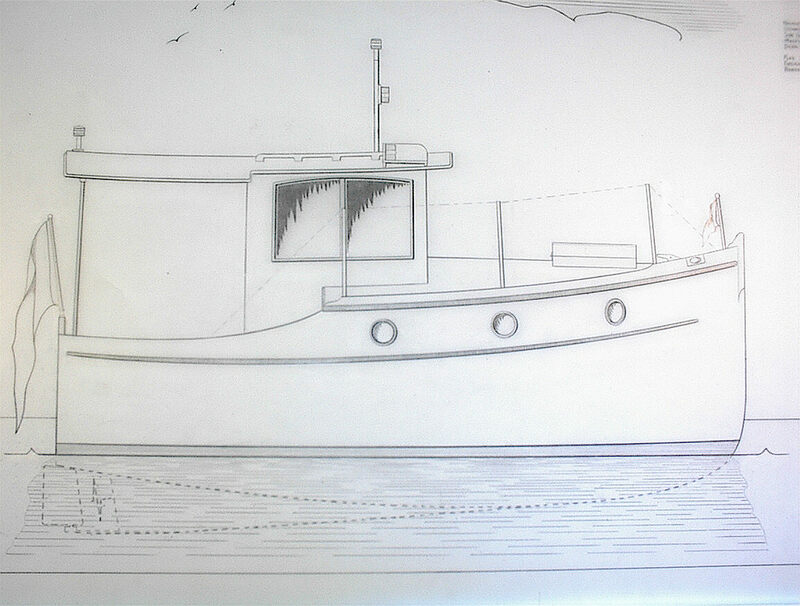 Maddy's lines show a very simple raised deck displacement hull form. The emphasis has been placed on extremely economical operation. We have shown the smallest Westerbeke diesel available, which is the "11a". This little engine produces about 8 horsepower at its most economical operating rpm, which is much more than this little vessel normally needs to reach her hull speed of around 5-2/3 knots. You can edge her up to 6 knots under good conditions but that's about it. Please don't put in a bigger engine. Sure if you find a 10 horsepower 1 year old diesel in good shape that you can get for $500, you are going to have to go for it, but don't do it because you think you will go faster. If you will pardon Old Irascible the yacht designer for an occasional rant, I already know that some people will buy the plans for Maddy, put in 10 horsepower, 15 horsepower, or even 20 horsepower and say, "Thank Heaven I didn't listen to you and put in more horsepower. Why she'll barely do 6 knots with the horsepower I put in." Look, Dear Reader. She won't go over 6 knots. If you put in more horsepower than we recommend you are not going to go significantly faster. You are just going to use more fuel. Be smart and don't second-guess us on this. With the recommended engine, range is just a matter of how much tankage you want to put in. You could put enough fuel aboard Maddy to go down the entire East Coast without refueling if you wanted to. The only thing I don't like about Maddy's "lines" is the deck camber. To get real standing headroom in an 18 foot boat is quite a feat. She looks chunky but not unduly high. However to achieve that we put a lot of camber in the foredeck. This means that you aren't going to want to walk around up there much. She'll make a determined attempt to spit you overboard. This means that it may often be a good idea to anchor by simply going through the cabin, opening the forward hatch and putting an anchor overboard standing right in the hatch. There's no reason not to do this and it is very safe. Of course coming along side a dock in calm weather, or something like that, there in no reason not to go onto the foredeck if you want to. However, I'd want to have lifelines if I was going to make that much of a regular practice. Of course young agile kids won't think anything of scrambling up there. We have had great results from a wide variety of builders with sheathed strip construction. It seems to be one of those rare methods that is a good fit for both amateurs and professionals. Given the straightforward nature of the construction and its excellent neglect resistance, we are inclined to use it whenever the client will allow and the vessel is intended to be of wood and epoxy. We use an extensive amount of filleting and taping between members. This not only creates wonderful rigidity and a very clean, one piece, sort of look to the underlying structure, but it also is very easy to keep clean due to the lack of sharp dirt collecting inside corners. Those who would like more detail on this method should read our "Sheathed Strip Scantlings Rule" and our article reprint "The Sheathed Strip Alternative". On a Friday night, after a hard week in the office or on the shop floor, there's nothing like throwing your gear in the car, along with some canvas tote bags with food, and leaving your cell phone carefully and precisely in the middle of your desk at home; so that there is no possibility that your boss will be able to contact you over the long holiday weekend. At the harbor your little pram dinghy is tied to a tree on the shore. You grab your oars and oarlocks out of the car, lug your gear down to the water's edge, and untie the dinghy. With you on one side of the dinghy and your spouse on the other you both together can easily carry her down to the water. Since it is nearly high tide you row out to Maddy and while your spouse piles the gear on a large rock out cropping which runs down into the water and has one bold edge, you bring Maddy in from her mooring at idle speed. With a couple of bumpers over the side, it is easy to come alongside the rock and throw a loop of line over the old bronze bollard that you fastened into the crevices in the rock with bolts cast in cement. All the gear is passed quickly aboard and the loop of line is released. Putting Maddy in reverse at idle allows you to back gently out a ways until you can back around a quarter of a circle and then going ahead and turning another quarter circle you find yourself headed out of the harbor. Still at idle speed, for politeness sake, you thread your way through moorings and other yachts and fishing boats until you are past the pens of one of the local salmon farms. Even clear of the harbor you only throttle up a bit. There is no need for much speed as you plan to go down through Lubec Narrows and out into the Bay of Fundy, since the weather looks really nice and the wind is off the land. You prefer to go through the Narrows pretty close to slack water high and you've still got a bit of time. Maddy is running about 5-1/2 knots. Her bow is up just a bit from the at rest angle. Because you didn't waste money on a big engine, you happily spent a bit on the very best sound insulation for the engine room so at the moderate rpms needed to go this speed you have a relatively quiet ship. There isn't much wind. The little waves don't break and the water looks like rippled glass. The islands are patterns of all the subtle shades of coloring that nature can produce. You see the occasional seal; and as you pass Shackford head you see two of the eagles that often congregate there. Nearing the International Bridge at Lubec you pass the site of the former Lubec Marina a government project located in precisely the worst place for a marina in Lubec. Apparently this was done because, as usual, someone didn't think they needed to pay any attention to local fishermen and other marine business operators. After all the local people having spent their entire lives on the water in this area couldn't possibly know as much as some one from out of town with fancy degrees and a briefcase. To be a good fisherman you have to be very intelligent and hard working. You may or may not have a great amount of formal education, some do, some don’t. But you aren’t going to get very far if you haven’t educated yourself in your business. However somehow and to certain people that sort of education doesn’t "count". Too bad. Millions down the drain for no good reason. Reflecting on this, you pass under the bridge with the current just starting to run. Knowing that you no longer have a rising tide you are especially careful to follow the winding channel rather than simply heading straight down to West Quoddy Head. This time at least your care is rewarded and you do not spend hours on the mud flats waiting for the tide to come in. By now it is mid-morning and the wind is beginning to pick up. Fortunately, however it is off the land so as you head nearly west along the coast, you are progressing through relatively calm water. On the starboard hand there are cliffs or high land and on the other nothing but sea. Intellectually you know that Nova Scotia is over the horizon but it feels like you are truly out in the North Atlantic. Maddy is, of course a coastal cruiser not an ocean voyager. None the less she is amply seaworthy provided she has time to get in out of any really major storms. The weather is benign and there are two harbors you could duck into if need be before you get to your destination for tonight. The first is Bailey's Mistake and as you cross the entrance you train your binoculars on the harbor and note the ledges, islands, and spurs of land that jut into it. From here it is hard to believe that a little boat like Maddy can thread her way in there and be in the most benign, sheltered little area you could wish. Further along you pass the entrance to Cutler Harbor. Here the land is thickly wooded with fir and the binoculars here show one of the most immaculate little fishing villages you could imagine. Some of the best choose to fish out of here and the well kept boats and tidy houses reflect the fact. By now it is early afternoon and you are approaching a channel in back of Compass Island which leads to Machias Bay. However instead of going on you work your way up into a little harbor formed by a cove on the back side of Compass Island on one side and another island on the other. Aside from a bit of wind in the trees and some sea swell breaking on the other side of the island it is dead quiet here in this little harbor in the bright sun. The tide is down quite a bit now, of course, enough to give you a feel for how much further it will fall. Slowly you work your way up and explore the inner part of the harbor, finding the remains of an old dock, a pretty good careenage and the remains of a homestead. You and your spouse talk briefly about the life someone must have had here and what a nice place to live it would be in the summer, with a little house there, the dock repaired, and Maddy to travel in to Machias for supplies. You drift with the engine in neutral for a bit discussing this, but conclude as you always do, that you don't need to own an island when you have Maddy. If you have her, in a sense you own all the islands. Putting Maddy in gear again you run back to the center of the harbor and while your spouse heads up into the wind you go forward through the cabin and open the forward hatch. This allows you to stand comfortably with your feet on the head counter tops, putting you about waist high in the hatchway. It is then quite convenient for you to unlash the 25 pound CQR best bower to starboard and lower it over the side. When a glance at the shore shows that Maddy, gliding along in neutral, has stopped and just barely started to move backwards, you lower the anchor by its chain and as the boat falls back carefully count the hand over hands until you feel the weight lessen as the anchor hits bottom. Then you count again until you are sure you have plenty of scope out. Since you are anchoring with chain rode, you know that however fluky the wind Maddy will not take to charging around her anchor as so many boat do with their light nylon rodes. You go back to the wheelhouse and watch for a bit with the engine ticking over to make sure that the anchor is holding well, though you know it essentially always does. Finally you turn off the engine. It is only mid-afternoon so you pull the dinghy alongside and row ashore to explore the island, with you and your spouse each, companionably, taking an oar. As always, every island is it's own continent in miniature, almost a world to itself. The microcosm of Compass Island fascinates, as all islands do, with its mix of fantastic delicate plants, beautiful rocks tossed up on the windward shore, trees, mosses, green plants of unknown type, birds, insects, etc. You even startle a few deer who have swum here to colonize their own little land free of predators. Even man does not hunt here. In some respects every island is its own Eden and as always after a few hours exploring you feel that you come back to Maddy a little closer to a sense of the numinous, enlightened and at one with each other and the world around you. Compass Island isn't exactly a cross roads of civilization so you are gently intrigued as you get back to your dinghy to find that there is another powerboat anchored near enough to Maddy to be company but not near enough to be intrusive. Probably this is an example of a quite deliberate fine judgement of politeness on the owner's part. In effect saying, we don't wish to intrude, but we are friendly if you wish some company. Interestingly enough she looks to be a working lobsterboat about 36 feet long. For the sake of a little variety in your fun you decide, short row or not, to put up the little spritsail on your dinghy and take a turn around the new arrival. Your sail going by their ports brings a couple on deck. A little chat reveals that they are in fact a man and wife team of working lobster fishermen from Monhegan Island, well down the coast. Since in Monhegan they lobster in the winter, summer is a time for them to set the bait bags in their plastic totes ashore put some cruising gear aboard and explore the rest of the Maine Coast. They have a large amount of clams that they had dug the day before and kept in a tub of salt water to purge themselves of sand. They ask if you'd like to have steamed clams for supper with them. You of course say yes but suggest that you cook them aboard Maddy and have dinner there so that they can visit your boat as well. To this they readily agree and row over in company with you. While you show them your tiny engine, which looks like a sewing machine compared to theirs, your spouse puts the clams in the kettle with a little salt water to steam them and starts cutting some bread and getting some herbs together to put in with the butter you will melt and dip the clams in. You show your new friends that there is an enclosed head forward and two berths with lockers and bookshelves. They express pleasure at the history section of your bookshelves, with many volumes that cover the area. They are also intrigued by the fact that you have copies of a vast number of marine books aboard on recordable compact disks so that you can read them on your laptop computer. You explain that this material and your computer allows you to combine a vacation with a little marine writing, since you don't have to leave your research library ashore. They are greatly interested to find that your boat, although about half the length of theirs, has very nearly the same amount of useable space. Indeed once you have demonstrated how the side curtains around the cockpit can provide a nice private pavilion for a cool evening, which this is turning out to be, Maddy actually has more enclosed living space than the larger boat. It is a wonderful evening swapping stories, telling of dumb things you've each done and fun things you've done; places you've gone and people you've met. Their life intrigues you on their island well out in the sea, fishing in the winter and spring only. They tell you how easily they can tell how much fun Maddy must be and how much less expensive she must be to run than their boat. You tell them about your plans to head south for the winter in the fall, expecting to get as far as the Florida Keys. That sounds like a wonderful adventure to them and they say that while they probably couldn't afford it in their own boat because of the fuel costs, Maddy would be ideal for that sort of benign adventure in protected and semi-protected waters. Eventually yawning begins to interrupt conversation and they row home. Before you go to bed you can hear one of them playing a concertina in the darkness. Getting ready for bed you think about tomorrow, when you will probably head on just a bit further past the wild windswept pair of high craggy bits of land connected by an isthmus that is called "The Brothers" and on to Roque Island. Nearly a small kingdom by itself and owned for certainly well over a century by the same family, Roque has a mile and a quarter white sand beach which looks more like the tropics than like Maine. You figure that if the wind is right you will anchor off the beach for a bit. Some people swim here though it is unlikely that you will find the courage in waters this temperature to do so. Later you will probably work you way through the little tickle at one end of the beach. This leads to the harbor on the other side of the island. You will spend the night there. So you've had a wonderful day and should have another tomorrow. Really it costs so little to live and travel on Maddy that you often feel that one of these little trips you'll just keep going and never go back to regular jobs and to bills. The fact that you could actually do so anytime you want gives a wonderful freedom to your life even when you are not aboard. Knowing you can leave them anytime makes going back to your job and your car and your payments for various services a free choice, and therefore because you have Maddy never again a source of tension. Maddy really, therefore, impacts your whole life and whole happiness even when she's laid up for the winter. With this comfortable sense of the fun you've had and the better mental state you enjoy due to Maddy you snuggle down in your blankets for the night and turn out the light.